Today's Quest Hub could also cover "Throwback Thursday". Before the Cataclysm, before Wrath of the Lich King, before Burning Crusades, at the end of the original game, there was a server wide event to open the gates of Ahn Qirag. People collected materials and resources to deliver to the Cenarion Circle in Silithus in order to ring the gong which opened the gates to the 20 and 40 man raid. I was not a part of WOW at that time. I only know the bits I was told. But, long after the gates were opened on each server, through Burning Crusades and Wrath of the Lich King, you could still pick up and do the quests to create the Scepter of the Shifting Sands, the actual tool used to ring the gong and open the gates. To make the scepter, you needed to go all over the world, collecting materials and fighting bosses. I started on it toward the middle of Wrath of the Lich King before finishing it. The premise was you needed to collect pieces of fire, ice and nature to assemble the scepter. One of the threads took you to Azshara and a shark named "Maws". I don't remember the other one but the nature one had you reclaim a well-known dragon. I don't remember how I got this, whether I found it in a run of Sunken Temple or somewhere else. I knew this was leading to the final boss fight, the final step for the green shard. I'd done most everything solo. It was very easy to accumulate stuff, even the elementium required for steps in the quest chains. (There were 3 corresponding to the three colors.) I bought a lot of that off the auction house because people were just dumping it and no one wanted it. In total, there are 18 steps to this final boss fight. At step number 8, you get this quest. The agent and I headed to Moonglade from there. 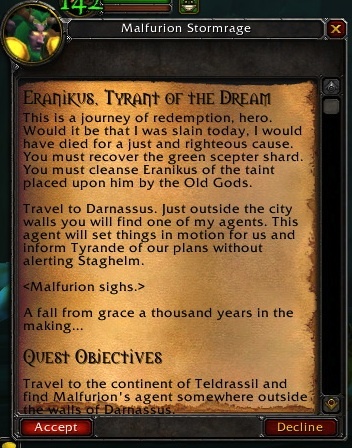 Once in Moonglade, there were a series of steps to confront Eranikus. You know Remulos in Moonglade? He has a few quick quests and then you never talk to him again. He factors hugely in the scepter quest line. That really is why he's in Moonglade. He was responsible for calling and then confronting Eranikus. 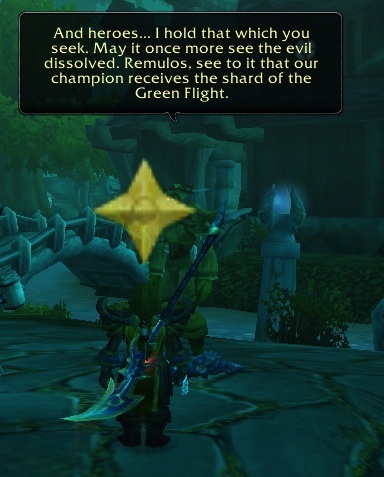 Omen's return during the Lunar Festival is interesting, but you have not lived until you see a green dragon materialize from across Lake Elluneara and come toward Nighthaven. What was also incredibly cool was that you did this event in real time. Phasing had only started with Wrath so anyone who was in Nighthaven, and this is the druid training area, could see and interact with someone doing this final quest. I'd had no trouble up to this point. I have a bear. I'm good. How wrong I was. Eranikus attacks Nighthaven and seeks to kill the druids and Remulos in particular. Your task is to keep him alive. Eranikus threw corrupted druids, shadow elves and minions and lots and lots of nature damage at you. I tried to deal with it and several level 50 and lower druids in the area came to help, but we were overwhelmed and killed. Fortunately, you could just run back, talk to Remulos and start the encounter over again. By the 4th wipe, I knew I had to ask my guild for help. 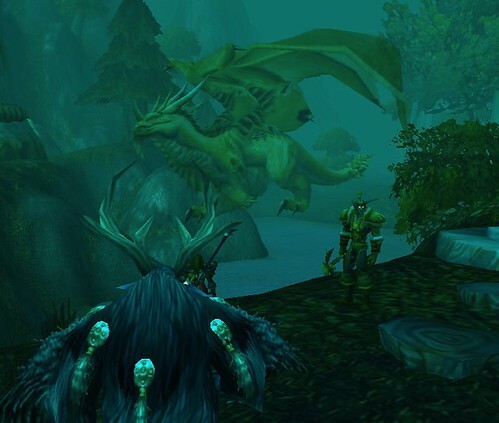 Several people came to help, more out of curiosity at my claims there was a green dragon in Moonglade. We were joined by a bunch of low level toons until we had a nice raid group of 10 people. I started up the encounter and we battled. It went on for a good 10 minutes, wave after wave of mobs, nature damage, dying and running back. It was intense, but so satisfying. 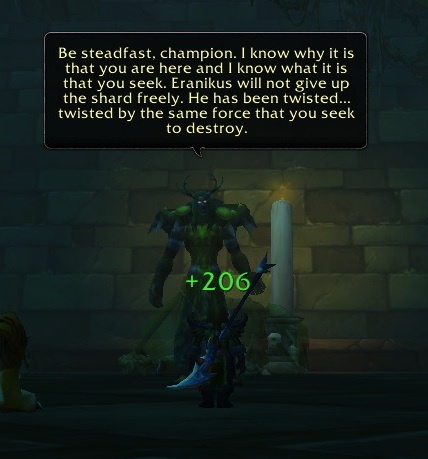 In the end, Eranikus is confronted by Tyrande. He claims she abandoned him. She rebukes him and he thanks her for purging his corruption and heads into the Emerald Dream. It was an amazing fight. I was very sad it was over. There's not been anything in the game which comes close to the epic nature of this. Oh we had our legendary cloak quest and currently have a legendary ring quest, but they have all been about gathering copious amounts of materials. They don't call on you to go over the whole of an expansion to get things and kill bosses. I know that in addition to the elementium from Blackwing Lair, I had to get drops off certain bosses. When I fought "Maws", I had to make sure I brought friends because the buoy used to summon him was one use. If you failed, you had to make another one. In downing the bosses, in finding hidden NPCs, in collecting the materials needed, I felt that I really was on a mission, even though the end result was not something I could ever use. It's a mace and hunters can't use maces. You could only equip it when you were going to ring the gong. After that, it was useless. I still have it in my bank. After doing all of that, there is no way I'm ever deleting that thing. This is the kind of quest that doesn't appeal to a lot of people. I would say most players just want to get their quest, do it and turn it in. Chain quests are of the "ewww" variety. Blizzard has gone to the "collect thousands of things" for legendary items. I don't think a legendary needs to come of a quest line like this. An epic experience that sends you all over the known world battling mobs in dungeons I haven't been in in years appeals directly to my sense of adventure. They take a lot of resources to develop, program and test. That kind of thing is not where Blizzard's focus is. I think the game is a bit diminished because of it.